I-75 North to Exit 288 (Main Street), left on Main Street, Right on Hwy 41 N (2nd redlight), go to 3rd redlight and then right on Center Road, Community will be on left. Carriage Hills combines a great neighborhood, community amenities, and affordability into one welcoming living environment. Consisting entirely of 3 Bedroom homes, Daniel Investment Group's Carriage Hills Subdivision is centered around a charming community pavilion and playground, inviting residents to relax near home. Carriage Hills is an excellent choice for those who prefer a more moderately sized home, but do not want to give up community amenities. 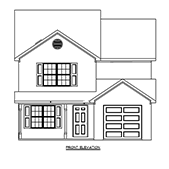 For a more detailed look at Carriage Hills please click over to the "Subdivisions" section of our website. Rents start at $899 per month. 3 bedroom 2.5 bathroom with 1-car garage.